Concurrent licenses are acquired by the Golden Software program (license client) over the network using UDP over IPv4 by default. If your network only supports IPv6, you can still use concurrent licensing, but you need to set the license client PC with a Windows environment variable which tells the Golden Software program to use IPv6 when communicating with the license server. These steps are also valid for Microsoft DirectAccess environments which use IPv6. The license server must have IPv6 enabled. The client PC must have IPv6 enabled and working. The client PC must be able to reach the license server on the IPv6 network over UDP. Setting the variable will force all Sentinel licensing on the client to use IPv6. To switch back to IPv4, either clear the value or set it to "4". Use your in-house PC management/deployment tools to set the system environment variable LSTCPIPVER value to 6 on the client computer(s). Click Select License Server in the <Product> Licensing dialog. Toggle Search for license servers on the local network and then click Search. Toggle Enter license server name and then enter the license server's name or IPv6 IP address. You can also set the client computer to connect to the license server automatically through the Windows Registry or using a Settings file. Go to the client PC (the one running Surfer or Grapher). Close Surfer or Grapher if currently open. Click Advanced System Settings on the left hand side of the window. Click the Environment Variables button on the Advanced tab. Click OK in each of the open dialogs. 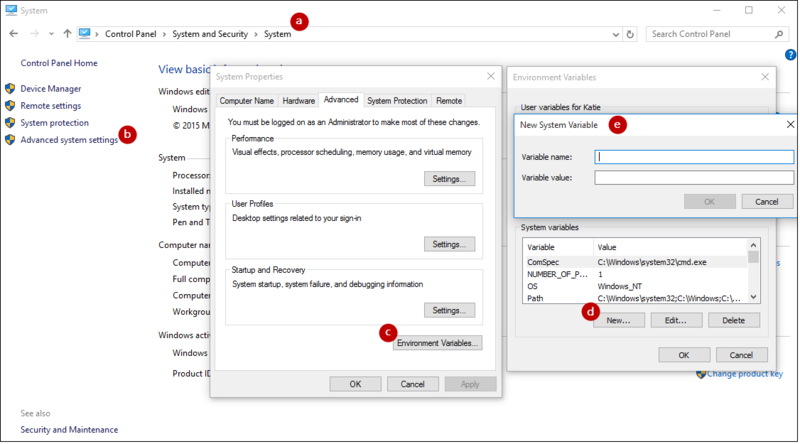 System Properties dialog and the Environment Variables dialog overview.